Creating great help content is a dialogue between your content team and your product team. It starts with asking the right kind of questions to get the best content out of them. The Greek philosopher, Socrates, knew this well – he taught us that questions help us draw out underlying ideas and presumptions we can’t otherwise access. They help you challenge your internal assumptions about how your product works, discover powerful ways to help customers do the jobs they need and answer tricky questions they’ll genuinely have. So if the questions you ask your team, yourself and even Google, directly impact the quality of the advice you can offer, how do you go about asking the right ones? At Intercom, we know the questions we ask will form the meat of our published how-tos, best practice guides and FAQs. And so we plan them very carefully. For example, when an important feature is launching at Intercom, I want to drill down into the following four questions. 1. What job was the feature built to enable? Why did you build this feature? What problems were customers having? What are the specific jobs it lets customers do? What are the very best parts of this feature? Get your hands on any early stage research that was conducted and look at specific questions customers were asking. For example, “How secure is the new feature?” and “Is it difficult to use?”. Pay particular attention to how customers word their questions, their desires and their fears – you should address these later using similar language when writing your content. Takeaway: The answers you get will help you address the real problems your customers are having and the jobs they want to do. 2. What’s the best way to use the feature? Best practice content helps our customers excel at the jobs they hired it for. Because we’re lucky enough to use our own product every day (Intercom runs on Intercom), I get to interview end users of our product right here in our office. I ask them for both product related and non-product related advice so we can equip our customers with the information to excel at the jobs they hire our product for. What jobs will the feature help customers perform, and how? What advice would you give a new employee on your team for using this feature? How would you impress your CEO with this feature? Do you have any other tips for excelling at this job, even if this feature didn’t exist? When we gather best practices for a specific job, we research the overall landscape so we can provide our customers with the best advice possible. For example, when we wrote our guide for creating an effective onboarding campaign, we researched the types of content that existed around onboarding and marketing automation so we could show customers the best ways to convert their trial users into paying customers. Takeaway: The answers you get to this question will make a great best practice guide. 3. How does the feature work? You can quickly get up to speed with how a feature works by using it or familiarizing yourself with the design spec. But if you’re not an engineer it can sometimes be difficult to understand the more complex, technical aspects of a feature. At Intercom we want customers to understand the job each code snippet helps their team do. 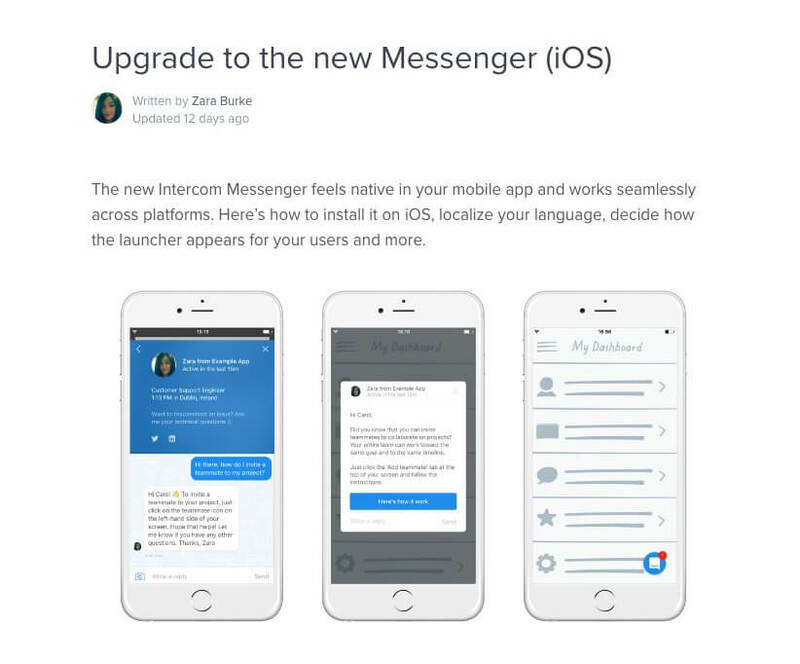 For example, when we launched our new Messenger, we wanted customers to understand why they should update their mobile SDK, as well as how. Instead of just publishing the code, I sat down with an engineer and asked questions like, “Why would customers upgrade to the new Messenger?” and “What does each code snippet helps customers do?”. With that information, we were able to create a more accessible guide that showed customers the value of upgrading. To further encourage the engineer you’re speaking to to explain the concept in a more accessible way, simply ask, “What do you mean?” or “Could you put that a different way?” Have a go at explaining it in your own words too so you can clarify any confusion, there and then. Takeaway: The answers you get will make a great how-to guide that both engineers and their non-technical colleagues can understand. What are the limitations of the feature? Ignoring aspects of your feature that confuse or frustrate customers won’t save you time or grief. Instead, your customer support team will still have to pick up the slack for you. A better strategy is to anticipate questions your customers are likely to have and problems they might encounter with your feature. What aspects of the feature are customers most confused by? What exact detail confused them most? What do our customers want our product to do that it can’t? Are we planning to address these issues in the product or will we need to address it in the content? Did anyone leave feedback about the beta content we published? If you ran a beta of the feature, take a look at the feedback you’ve received. At Intercom we tag this feedback so we can easily read through it later. If you find customers are consistently asking specific questions, make sure you answer them in your content. Takeaway: The answers you get to this question will make material for some very effective FAQs. Asking the right questions from the outset helps you extract well – thought out, accurate advice from the right experts in your company. You’ll rest assured that you’re not just leading with your own assumptions. But most importantly, you’ll know that you’re fighting your customers’ corner from the very beginning – to make it easier for them to understand, to answer tricky questions and to help them succeed. Now that’s helping!